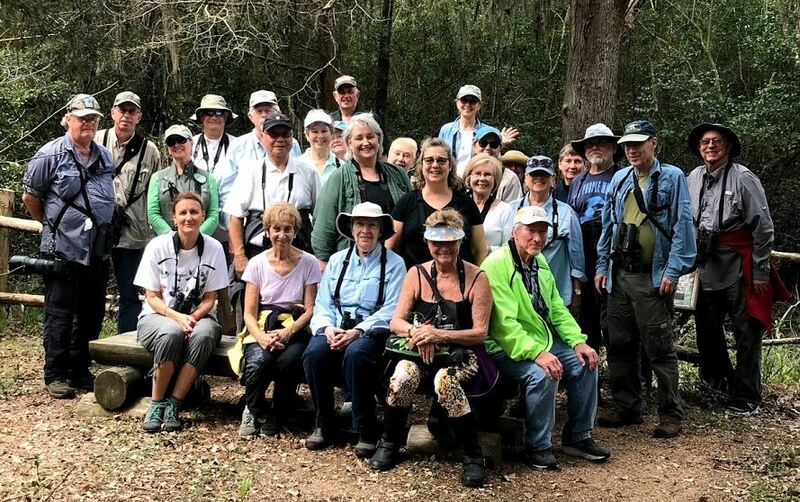 Thank you to the great group of folks who joined me for the Senior Bus Trip to Buescher State Park on Tuesday, March 12, 2019. Taking trips to parks I have never been before can always be a bit challenging but I had great help on board and great birders aboard who are always so eager and willing to share their knowledge. The morning started out with a bus ride through dense fog but the fields of bluebonnets and paintbrush along I 10 and highway 71 were beautiful even in the low light conditions. Upon arrival we headed to the north end of the park and the burned area from the big Bastrop Fire in 2011. It was an eerie landscape in the fog but was home and habitat to lots of birds including bluebirds, warblers, titmice, woodpeckers and chickadees. After enjoying some of the trails in this area we drove south to the lake. Everyone enjoyed a hearty picnic lunch and our bus driver showed off her crazy driving skills as we made our way through some very tight spots both backwards and forwards. Lakeside we enjoyed more birds and lots of damselflies. A beautiful siege of Sandhill Cranes came streaming by to the delight of us all before we boarded the bus for our return trip. Of course we all enjoyed our visit to Buc-ee’s and Prasek’s Smokehouse along the way. Next stop for the bus trippers will be High Island in April. Here is a photo album from our trip.